Travel to the zoo in a different way – on-board a motor cruiser or steamboat. Avoid traffic stress in the city and have a wonderful experience with your children. 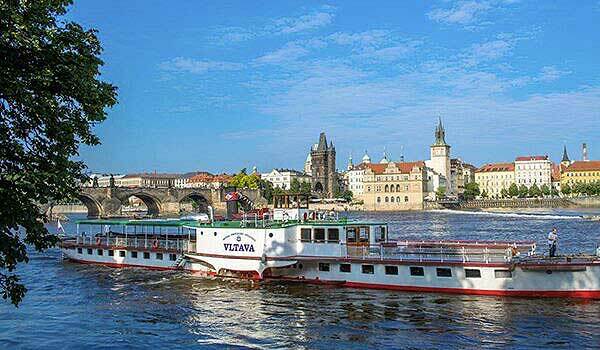 During the comfortable cruise you will have the opportunity to show your children an interesting view and Prague monuments and also enjoy refreshments. 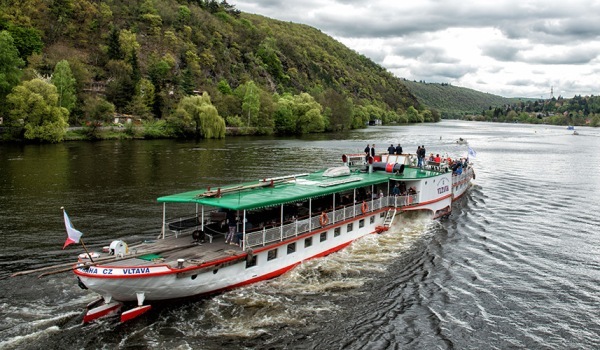 The regular boat connection departs from the Rašín Embankment or from Čech Bridge and in 75 or 55 minutes respectively will take you to the dock on Císařský Island near the zoo. 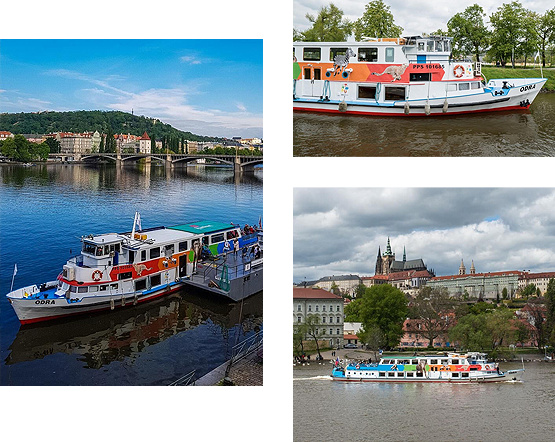 In the same way you can enjoy the trip home and again embark from the dock on Císařský Island and cruise by boat back to the centre of Prague to Čech Bridge or to the Rašín Embankment. Even the trip to the zoo or back will become an extraordinary experience and children and adults will long remember the day spent in this way. 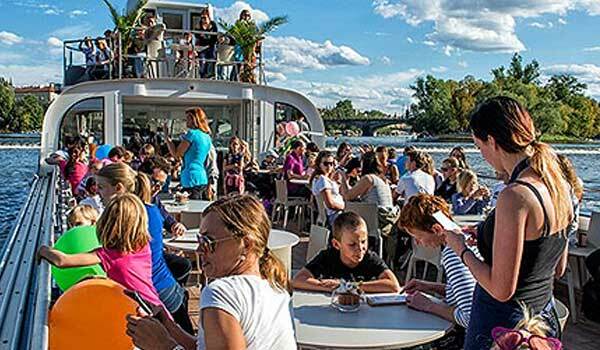 20% discount on cruise from Rašín Embankment for seniors over the age of 65, groups of over 20 and students (with a valid student card). Holders of special handicap cards (ZTP) are provided a 50% discount, while their assistants ride free of charge. Children up to 3 years free. Child's fare for children from 3 – 11 years. Baby carriages free. Bikes per 50 CZK. This combo ticket can not be purchased online, please buy it in the office at Platform No. 2. No additional discounts can be given to the ticket. A combo ticket is valid only on the day of purchase. For more information about the zoo opening hours, admission or events, visit the Prague Zoo website. 29. 4. – 1. 9. 2. 9. – 30. 9. 29. 4. – 31. 5. We do not reserve specific places on the cruise so it is wise to come on time, especially during the summer months, Saturdays and public holidays. The boat departs from the Rašín Embankment or from Čech Bridge. 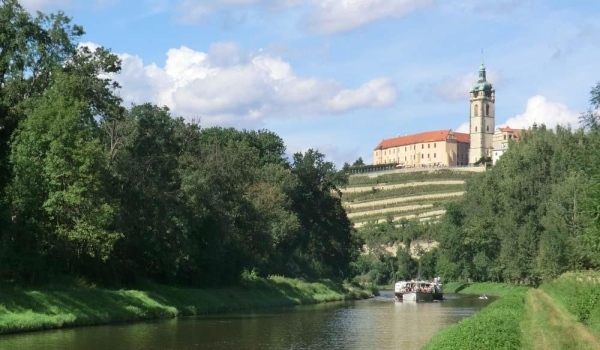 The boat sets sail downstream from the dock on the Rašín Embankment and first passes through the Smíchov lock chamber and then past the shores of Kampa under the Charles Bridge. It passes the lovely Kosárek Embankment and stops at the dock at Čech Bridge. Here it's possible to board the boat. From there it heads further downstream to the lock chamber at Štvanice Island, past Holešovice and Libeň, under the Barikádníků Bridge and the new Troja Bridge before heading to the dock at Císařský Island. Here the cruise ends. After disembarking at Císařský Island, follow the road to the Císařský Island riding hall and to a ferry across the Vltava River. After the ferry take a left onto Povltavská Street, which will lead you straight to the lower entrance to the zoo. Or you can turn past the parking lot on U Trojského zámku Street and enter the zoo via the main entrance. The whole walk takes about 17 minutes. This combo ticket can not be purchased online, please buy it in the office at Platform No. 2 on the Rašín Embankment - between Jirásek and Palacký Bridge. No additional discounts (senior, student, group) can be given to the ticket. Combo tickets are not provided free of charge to the group accompaniment or to the school accompaniment. Children's Combo ticket is valid for children 3-15 years old, children up to 3 years free. A ticket is valid only on the day of purchase. This combo ticket can be used only in the direction of Rašínovo nábřeží - zoo. This combo ticket can be used only in the direction of Rašínovo nábřeží - zoo – Rašínovo nábřeží.